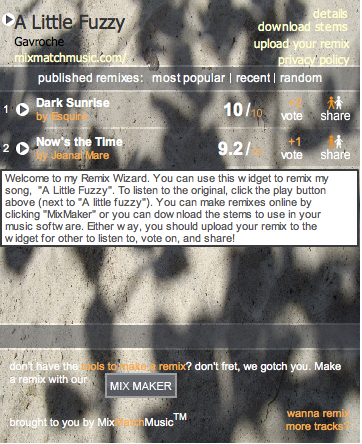 Tag Archive for ‘musicians’ « .Evolving Music.
. 1 Comment Tags: Artist tools, artists, Gavroche, MixMaker, mixmatchmusic, Music Collaboration, musicians, Myspace Aps, Remix Contests, remix promotions, Remix Wizard, remixing, social media, Stems, Widgets.